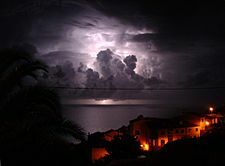 Thunderstorms are rare in cold weather. When they happen, it is called thundersnow. Usually there are more clouds in the afternoon than in early morning. This is because the ground has warmed up enough by the afternoon for strong winds to blow upward from the ground (these winds are called updrafts). If there is very little moisture, an updraft has to go much higher before the water vapor condenses into a cloud. Sometimes the air can rise up as high as 5,000 to 10,000 feet (1,524 to 3,048 m) before a small cumulus cloud can condense from the invisible water vapor. 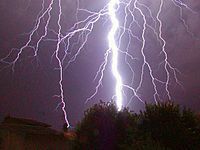 Thunderstorms are very active electricity. Lightning is a large electrical discharge that happens between two opposite charged surfaces. 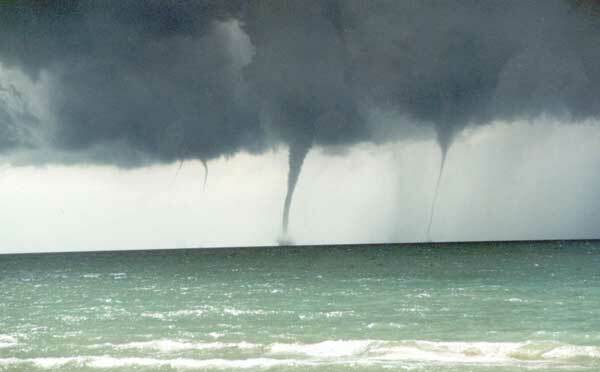 Thunderstorms do not do only damage, however: they can be a great help to man and all living creatures. We get lots of water for many continents during the summer. Plants receive lots of life-giving rain when they need it. Without the thunderstorms, many continents would become dry. Fish would die, crops would fail, and animals would die. Thunderstorms are also our natural air conditioners. Hot air at the surface rises up into the high atmosphere where it is put out into space. Clouds give us shades, and rain can cool down a hot day. Without thunderstorms, the earth would be as much as 20 °F (11 °C) warmer. In the summer, dust, haze, and other pollutants come together in the lower atmosphere. When the air rises, either in cumulus clouds or in thunderstorms, spreads the pollution higher up into the atmosphere. Rain from thunderstorms washes away many of these pollutants out of the air. 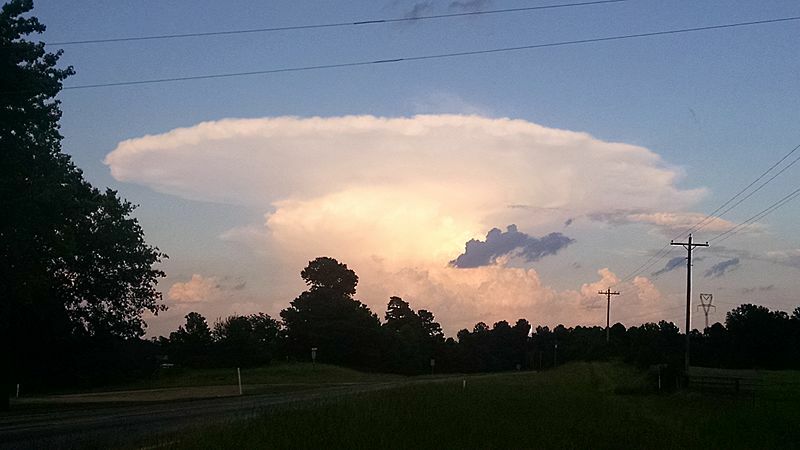 Warm, moist updraft from a thunderstorm associated with a southward-moving frontal boundary – taken from Texarkana, Texas looking north. Thunderstorm Facts for Kids. Kiddle Encyclopedia.